Hello Amigos! Greetings from Mazatlan! The new year has started in a great fashion for our customers who are having an excellent time deep sea, mangrove and inshore fishing. January showed us a good time and even some surprises as not only Striped Marlin have been caught, but also Sailfish and Dorado (to 33 lb) in good numbers. The latter are usually caught mainly in the summer and fall. February has started with more Striped Marlin, Sailfish and Dorado caught. Other fish caught include Skipjack Tuna and Frigate Mackerel. Best baits these days have been mullet and ballyhoo. Bottom fishing was outstanding the whole last month and a wide variety of fish were caught. These included: Trigger Fish, White Sea Bass, Grunts, Mojarras, Red Snapper, Amberjack, Barred Snapper, Pacific Pompano, Mackerel, Gulf Grouper, Yellow Snapper, Spotted Rose Snapper, Mexican Lookdown and Cat Fish, among others. Trolling action for Jack Crevalle fair to good. Largest fish of the month: 20 lb. Mangrove fishing keeps very good for Snook, White Sea Bass and Red Snapper. Best bait: Live shrimp. Special mention to our fiends Denise, Bill and Dan who had a succesful fishing trip at the mangroves on 01/16. Catch included 3 Snook (to 9 lb), 1 White Sea Bass and many Snappers, Grunts and Mojarras. 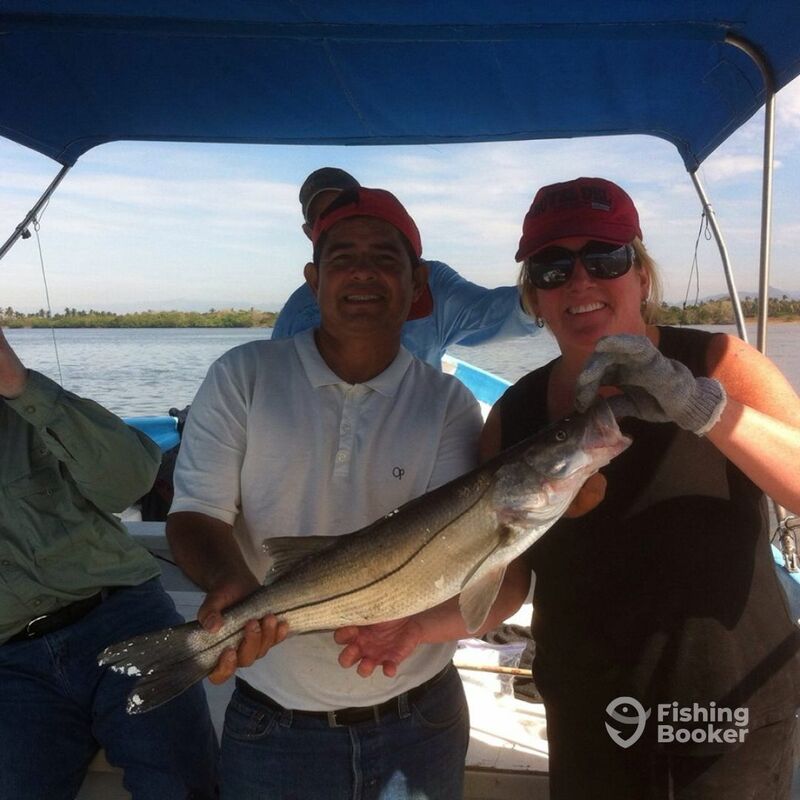 Photo attached of Denise with her first ever Snook and Tony, one of our pro guides. Way to go! No port closures since 01/03. Water Temperature is currently: 76 F.